This 5.56 NATO ammunition from Federal is the much sought-after Lake City production that AR-15 owners love to shoot due to its reliability and military provenance. These cartridges come in a large 2,000 round case and follow the M855 standard currently used by the military. Each round fires a 62 grain full metal jacket bullet at a muzzle velocity of 3,100 feet per second. 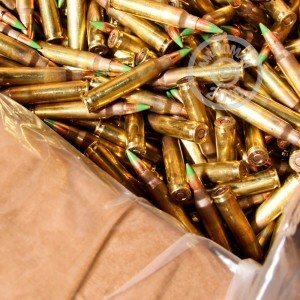 This mil-spec ammo is made at the Lake City Army Ammunition Plant in Independence, Missouri using non-corrosive Boxer primers and brass cases with visible annealing. Unpolished brass complies with military specs and demonstrates that the casing has been formed correctly. It's a feature, not a bug! Get a hold of this volume priced case or any otheritems over $99 at AmmoMan.com to earn free shipping!